I have recently got into bento. Inspired by Grace at Eats Amazing, I have started to get out little cookie cutters when making Mushroom a packed lunch for days out. Also the recent discovery of his Gruffalo plate (which I though we’d lost long ago) has made me get more creative with his lunches at home. However.. . On showing off a lunch I was particularly proud of to a friend, they were impressed, but relieved to know it’s not something I do all the time. In fact, although this friend enjoys blogs such as Eats Amazing and the Lunchbox Doctor, they said they felt a little ‘inadequate’ in comparison, for not making these amazing lunches every day. I personally don’t feel this way – yes, Grace is amazing. But I’m sure there is something I can do that would seem equally amazing to Grace. We are all awesome in some way (go on, click the link and revel in your awesomenaciousness) but I do get it. Although I get really excited by my creative genius when I do make an brilliant bento, I also make pretty boring (although I hope fairly healthy) lunches for Mushroom, and occasionally I also feed him junk. Shaped sandwiches, cheese, tomatoes & salad. Not a bad effort. Hummus and carrot filled tortillas, roast veg, ham, tomatoes and more hummus! Pasta with veg, bagel cheese toasties, peppers, cucumbers and one of Mushroom’s favourites… Olives. Egg, pesto pasta and veg with black grapes as a post swimming snack. And finally, my brilliant (well I think so!) 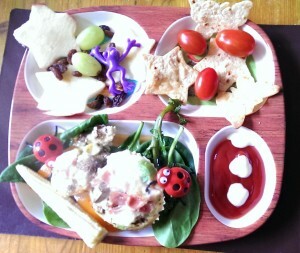 bento lunch to wave goodbye to daylight saving and welcome the first days of summer – the ladybird garden. Yay me. Egg, ham and leek ‘cakes,’ on a bed of spinach leaves with a broccoli tree and sweetcorn sticks. Tomatoes with chilli tortilla star and butterfly crisps, ketchup and salad cream ladybird. For dessert, apple stars with grapes and frogs in the pond with tadpoles (raisins). 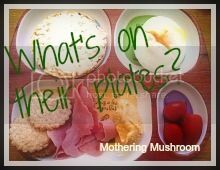 I am also linking up to Fun Food Friday with this post as I am proud of my bento effort. Click the link below if you’d like to be inspired by even more amazing efforts. And… drum roll please… Here’s my badge! I am pretty proud of this too, for you to add when you link to Whats’ on their Plates? I love this! What a great idea for a linky! And I totally understand your post – While I can make a fun lunch I feel very inadequate when I go into some friends’ ‘magazine perfect’ houses – we all have our talents and weaknesses! Thank you so much for the lovely mention! I love these! My daughter has just started taking packed lunches to school, so thinking I’ll get creative like this soon! Thank you! Do link up do this linky if/when you do!